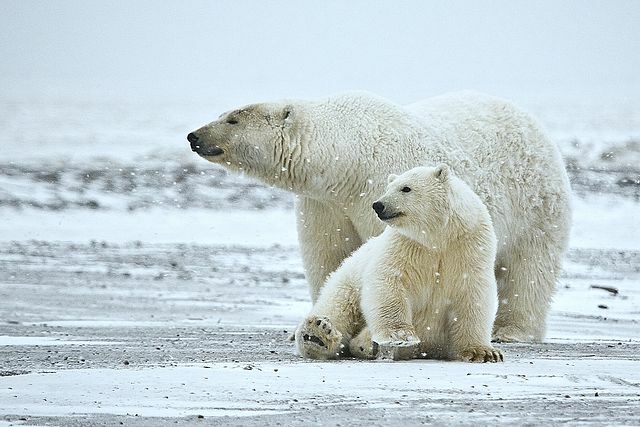 Finally, Polar Bears in Snow! After 3 trips to Kaktovik and 2 to Churchill, Manitoba I’m happy to report that I finally got images of polar bears in snow and on ice on this polar bear photography trip. You’d think this would be easier, but climate change is a real thing. I’ve been looking to bring guests to Kaktovik, an island along the shores of the Beaufort Sea for some time now, but the logistics are always challenging. Still, like many things in life, some of the best don’t come easily. And I think our guests will understand that, which is why I’m looking at this addition to our portfolio in 2019. Stay tuned for that. Right now, we offer the 24/7 polar bear immersion trip to Churchill, Manitoba, which offers great aurora viewing at night too. As well as our grizzly bear trips, which are world renowned! I left Fairbanks after attending the ATIA show and got weathered in, missing the afternoon boat tour in Kaktovik, but enjoying several mochas and a surprisingly lovely new concoction called the Cordusio at the Fairbanks airpot Starbucks. Seeing polar bears is all about timing, catching them when they are still milling as the snow and ice start to come in. This is because polar bears are waiting for the ice to form so they can go hunt seals. Once the ice is thick, they go hunt. Also, once the ice forms, the ice breaking skiffs used for tours can’t navigate through more than 4 inches, so they’re grounded for the season once it gets truly underway. After four trips north, I’ve accumulated lots of fall polar bear shots, a couple with a few flurries, but none in snow or ice. This year, I pushed my trip a little later, and SUCCESS. Bears on ice! Playing, sparring, nursing…heck, even a full-on fogbow (think rainbow except created by fog) arching over the whole scene. High fives for perseverance and patience. Look for this addition in 2019.